Sometimes you just want a good old fashioned concert that rocks and rocks it hard! That's what I found at the Honda Civic Tour, featuring Paramore, Tegan and Sara, New Found Glory, and Kadawatha. The concert as a whole had super high energy, a rapport with the crowd, and a down-to-earth feel. But one band stood out for me, and when you see band members flipping over each others' backs while they're still playing, how could they not? The Honda Civic Tour was awesome this year. Don't get me wrong, we loved every second of our time co-headlining the 2003 Honda Civic Tour with Good Charlotte, but this year's Civic Tour was very easy for us and extremely rewarding. The other bands on the bill were awesome and fun to hang out with, and everyone behind the scenes was super-professional and easy to work with. The biggest thing about this year's Honda Civic Tour for NFG was the fact that we were able to play in front of tons of new fans, both young and old, and the audiences all seemed to enjoy our music. That's something that's not easy to come by nowadays with so many bands/tours out there, so I think that NFG being on this year's Honda Civic Tour with Paramore, Tegan and Sara, and Kadawatha, was the best decision that our band could have made at this point in our career. Well, we're back home now, and plan to take a few months off, then we're going to begin recording the follow up to our last LP, Not Without A Fight. We hope to have this next record out by the middle of 2011, and, of course, we'll be touring a bunch next year as well, both here in the US and also overseas. I was impressed that you scheduled time specifically to come out and meet your fans. Is that something that you try to work into most of your shows? For NFG, the fans are extremely important to us. I mean, I definitely wouldn't be here doing this interview, 14 years after we started the band, if the fans weren't important. They're what keeps us going, making records, and playing shows. Like I said earlier, we felt as if there were plenty of people who either hadn't heard of us, or had heard of us but never had the chance to see us, and we wanted them to not only experience NFG on-stage, but also experience what NFG shows are usually like, which means a lot of crowd interaction, whether it's pumping your fist in the air, or meeting us at the merch booth or outside somewhere. We have always felt like our fans are just like us, kids that are stoked to be at shows, and excited to experience new music and excited to share in the energy that is NFG shows. Although we don't always have scheduled signings at all of our shows, we wanted to try to bridge the gap between a sold-out, 10,000+ person show at a huge arena and a small club show, so that anyone who had never experienced NFG would know that we don't feel as if we're too good or above our fans...we're right with them, hanging out, being normal kids at a show, ya know? My impression from watching your fans at the show was is that there is a great vibe between you and the fans. Has the relationship with your fans influenced you musically? You know, in a small way, I think the fans have definitely influenced us, mainly because as the time passes and we play more and more shows, I think we've began to think of how our songs will translate in a live setting even as we're writing/arranging them, and we have made decisions in the past to add parts to our songs or take parts away (or even change parts live) because of how we hope we can incorporate the crowd while we're playing our music in a live setting. Our site has a lot of fun celebrating influences from the '80s. Do you have any favorite '80s bands or nostalgia? Well, considering all of us in the band grew up in the '80s, I'm sure we'd all answer this question differently. Ian (our bass player) is our resident '80s band expert, and he definitely has his fair share of '80s music on his iPod, spanning from old Metallica records all the way to Phil Collins! As far as '80s nostalgia, who can ever forget some of the best movies ever that were released in the '80s...E.T., The Karate Kid, Back To The Future...the list goes on and on!!! I listen to a little of everything, including a whole bunch of the radio, to see what's out there. I just picked up the new Linkin Park record, and have been rocking that new song by Cee-Lo, "F*** You," a whole bunch. See the above question. We're hoping to be in the studio in early January 2011, for a release date somewhere near the summer, so look out for NFG in a town near you (with new songs to play) next year!!! 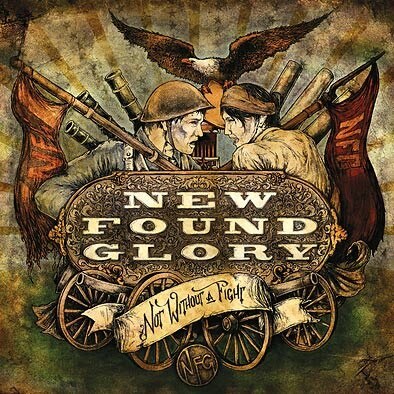 You can check out more of New Found Glory on their MySpace page or from their latest album, Not Without A Fight, available at iTunes and Amazon.